In Shape Fitness Center has been helping people improve the overall quality of their lives for over 30 years. In Shape Fitness is a one-of-a-kind, state- of-the-art, private health club where our members are valued. We are driven by results, not volume. We don’t just give you our facility – we give you guidance, motivation, and personalized attention. Our dynamic team of fitness professionals is here to give you the guidance, motivation, accountability and inspiration that will take your fitness to a whole new level, and achieve more than you ever thought possible. The sweet spot between Personal Training and Group Exercise, Team Training sessions are led and customized by our personal trainers for small groups less than 15-20. Unlimited access to 15 sessions per week for a low, monthly fee! We offer about 60 group classes per week between our Spin Room and our beautiful Group Exercise ballroom, all included with membership. Group Classes are designed to accommodate a wide range of ability – from beginner to advanced participants. We’re so confident you will love everything we have to offer here at In Shape, we welcome you to experience the benefits of membership for one full week, absolutely free! No cost, no obligation. Get started today! 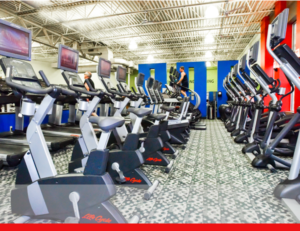 Visit us today and discover the benefit of living fit by becoming a member of the In Shape family! If you have not been to In Shape Fitness Center lately, you are missing out on some fabulous changes. We have finished our complete renovation of our facility and we are more committed than ever to providing you with the very best in club facilities, programs, equipment and services. Our expanded new Group Fitness area enables our center to further accommodate the incredibly successful and internationally acclaimed MOSSA programs featuring Group Active™, Group Power™, Group Kick™, Group Groove™, Group Centergy™, Group Fight™, Group Blast™, R30, and Group Ride™.